Chic Streetwear — Vanny et al. If I could describe my style in one word it would be CHIC STREETWEAR. Well, two words. I spent most of graduate school in a vintage camouflage jacket and motorcycle boots. It was basically a uniform. I paired the combo with sweats, sweatshirts, leggings, jeans to create a look that defined my early 20s! Now that I am (*ahem*) older, I am staying true to my love for streetwear, with a mind to elevate it and make it polished. Streetwear emerged in the 80s as a countercultural movement. Hip hop heads, skaters and punk heads, started designing clothes for their aesthetic and image. An aesthetic that has been true to itself decades later. With the rise and popularity of hip hop, streetwear is no longer a ‘counterculture’ but a global phenomenon generating billions of dollars, annually. Basically, every high fashion house from Dior to Gucci to Balenciaga and Chanel, must make streetwear staples like hoodies and sneakers to stay afloat. Backpacks and more recently fanny packs, are also part of the trickled down streetwear aesthetic taking over high fashion. This obsession with streetwear has created collaborations like Louis Vuitton X Supreme, and space for designers like Virgil Abloh of Off White, whose brand is basically where streetwear' meets high fashion. The major tenet of ‘streetwear is taking something classic and familiar and with the use of logos, graphics, proportion, make it cool and ironic. I think that is the best form of style there is! How I style the hoodie. 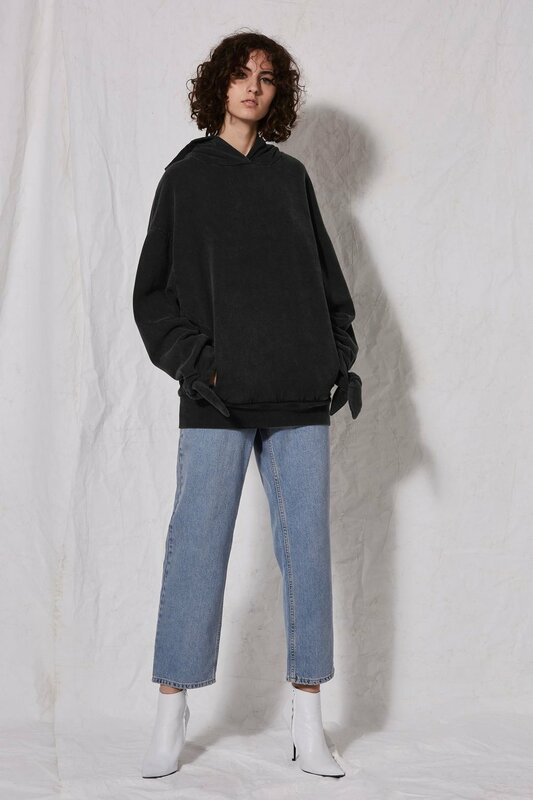 I love this hoodie from Ganni (Net-A-Porter) because the guipere lace trimmings make it look more polished. I paired it with a PVC mini from Forever 21, brogues from Tod’s and a Saint Laurent backpack from Matches Fashion. The backpack is a good casual balance to the classic brogue. Pick one item like a hoodie/sweatshirt, and pair with a luxe fabric like silk. Finishing the look with a pair of heels makes for an instant chic streetwear look. Another option is to go for an upscale hoodie. Many designers are making sweatshirts that can basically rival evening wear, by making them out of silk/tulle or covering them with embellishments. Add the right pair of heels to anything and its instantaneously chic. You can wear head to toe sweats, and when paired with heels the look can be party appropriate! When doing the oversized trend, make sure some other outfit component is fitted. Baggy shirt/jacket with fitted pants and vice versa. Boots and sneakers instantly add edge and cool to any outfit, respectively. Motorcycle boots and a dress is one of my favorite go to looks, or you can get in on the white boots trend! Don’t be afraid to go with menswear. I have long arms, and wearing a men’s shirt/sweatshirt instantly gives me the oversized look I am going for. Here are some other affordable shopping recommendations to help get you closet Chic Streetwear ready!